"You got the drive for this son?" I grinned, remembering the first words out of Ralph Miller's old grizzled mug when he'd hired me as a packer almost a decade ago. On just a couple cups of coffee, the morning's outlook was still a tad muddled as I rummaged through the cook tote for a meal for my client and me. I was mid way through my fall guiding season in remote western Alaska, and while only feeling slightly overworked, I was pretty sure I'd broken my tailbone on the last hunt. A week prior, while bear hunting, I'd taken a spill on the edge of a big lake while carrying a heavy pack. A basketball-sized rock with a sharp wedge in it connected squarely with my tailbone. It got worse before it got better, hurting like crazy in the meantime. "Well Ralphie, I said I did then, and I guess I still do now," I told myself, throwing back a few Advil and sucking it up for an honest day's work, which would be the beginning of a 12-day combination brown bear/moose hunt with a Southern gent from the state of Texas. Fourteen days later, I was sitting on a low mountain ridge my boss likes to pretend is an airstrip (quite successfully). Tired, sore and in desperate need of some R&R, I patiently waited for the faint drone of his Super Cub in the distance, which was my ticket to a steamy shower and two nights in a real bed. The Texan was already headed south, full of tales to share and a renewed spirit after two weeks in Alaska's embrace. He left with a brown bear rug and a fine set of moose antlers for his den. It was late September and I had been guiding in the mountains and on a wild Alaskan river since early July. Going on over a month straight in the field without a break, I was not only tired, but my tailbone injury hurt a great deal. I desperately needed a couple days of rest in town before my next hunt, but I had two more 10-day hunts to go, and missing them wasn't an option. It had been about 20 days since I'd cracked my tailbone, and it still wasn't healed. In those 20 days, I'd successfully guided two hunts, packed out two brown bear hides and the better part of a big bull moose, and walked well over 70 miles while hunting. It's safe to say I averaged not more than five hours of sleep per night, and barely managed to find time to cook warm meals in between. Despite the normal challenges and the added test of dealing with an injury, I managed to keep a positive attitude and remained confident. This, in turn, allowed my clients to have confidence in my decisions, and — most importantly — concentrate on their role in the hunt and not mine. In addition to my normal workload, there was the ever-constant requirement to keep my camps dry and attached to the mountain. Our western Alaskan winds can make that last part interesting at times — sometimes far exceeding gale force — and sometimes nearly doubling a gale force wind. This lends new challenges to the tent camping experience. Paired with earning very modest daily wages, abusing my body, getting very little sleep and being absent from my wife for months at a time, guiding a full season in Alaska is not for everyone. My current boss and close friend, Wade Renfro, always says guides have to love it because, in his words, "There's a hell of a lot easier ways to make a living." I can't say it any better. But ask me if I would trade any of the 170 to 200 days I spend guiding per year and I'll tell you the same thing every time: I wouldn't trade it for anything. Alaska is perhaps the last great place for the adventurous spirit. Guiding in the Last Frontier was a boyhood dream of mine, the realization of which has proven fulfilling in ways I never thought possible. My dream job also happens to be a bit unique when it comes to requirements of the work. Here's a little insight into some standard challenges we deal with and what's expected of a guide in the far north. Always the largest and most critical obstacle, weather potentially dictates nearly every single aspect of remote wilderness hunts, from logistics to success in hunting. Wind driven rain, snow, sleet and hail often fall horizontally. Sun, moon, daylight and the lack thereof can all affect a hunter's comfort, transportation, success and morale during wilderness hunting. For the guide, the mental toughness to deal with not only days, but literally months of inclement weather of nearly every kind imaginable, is absolutely mandatory. The very nature of wilderness hunting in the last frontier means a client's success rests on his guide's ability to operate the hunt in whatever diverse terrain and conditions in which he is placed. 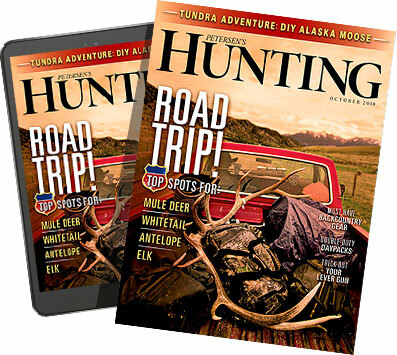 For example, a huge portion — roughly 22,000 square miles — of western Alaska where I hunt stretches from the treeless Bering Sea coastline to the timbered forests of the western interior — all very different country. An Alaskan guide should be versed in the different camping and survival skills each terrain requires. He should also be confident with all types of transportation required in hunts, from breaking trail with a snow machine on spring bear hunts, to safely navigating wild rivers with a raft or jet boat. A guide will be asked to complete a number of tasks at any time, including siwashing, a local term for camping overnight with no shelter and little provisions; safely clearing log jams for river travel; picking routes for the safest and quickest travel through mountainous terrain; and using a GPS to lead a client home in inky darkness. Alaska has some of North America's most sought after big game animals: moose, Dall sheep, mountain goat, brown bear, grizzly and caribou. Each species has its own unique set of challenges. To make the most of our available seasons, an Alaskan guide has to be well versed in the habits and hunting techniques for all the game he pursues. There is a huge difference, for example, between the preparation for a Dall sheep, mountain goat, moose or bear hunt. It means being prepared for different logistics, different camping equipment and different hunting techniques. As a result, most serious full time guides must be prepared for any hunt, any species, in any terrain. And then there are bears. Hunt big bears long enough with a number of different clients and you will eventually be required to follow a wounded animal into a place you don't want to be. I have no idea what one does to prepare for such things, but it's a nerve-wracking part of the job, I promise. After a decade in this business — first as an apprentice and then as a guide — I believe the single most influential contributing factor to any wilderness hunt is attitude. In the adverse conditions Alaska throws at you, keeping a positive attitude in the face of adversity greatly affects your ability to focus on the hunt. A negative attitude is like a disease — it's contagious, and the harder it sets in, the harder it is to change. Part of a guide's role is to provide an example of the right attitude. On any given hunt, there's a good chance the guide has been in the field for quite awhile — he's tired, he's been wet, cold or overworked for days, and yet his level of enthusiasm must be different than his client's. This is not once in a lifetime for him — it's another day at work. That's where a consistent, positive attitude is needed, not only to aid in doing his job well and successfully, but also to provide an example for his client. In return, that increases the odds of keeping spirits high and everyone's attention on the hunt. A good attitude is just as contagious as a bad one. There are quite a few good reasons why being an Alaskan guide is not for everyone, and some of those same reasons are what makes it so rewarding for the few of us crazy enough to keep at it — and good enough to do it well. It is certainly not about the money. Breaking a well-paid Alaskan guide's daily wage down into an hourly rate is quite depressing. Any able-bodied 15-year-old can pack lumber for his local framing outfit for the wages my 10 years of experience guiding pays me at an hourly rate. No, it's never been about the money. It's about being out there on the land. It's about plying a history-rich trade in one of the wildest, most breathtaking arenas left on our planet. It's about the primal pursuit of hunting. It's about being the sort of confident outdoorsman this great state has always bred, and having a unique opportunity to share that with others. It is quite possibly the toughest job in hunting. But I also can't think of any more rewarding.